Plants wilted, soil either moulded or dried up and even the cacti would die. The plants I had at home were symbolic of my life. I felt like I couldn’t breathe. At home, I had many responsibilities. My days started abruptly; I had no time to spare. I’d jump out of bed and was likely to clean the floor before I fed myself. My ‘to-do’ list was endless. By 2pm, I would have done more chores than most do in a week and then I would go to work. Returning home, often after midnight, I would feed the cat, and then chain smoke until I was exhausted enough to fight off the adrenaline and head to bed. In the dark, I would stare at my partner who would grind his teeth and thrash in his sleep. Often, he also snored. I didn’t sleep well. At first light, I’d jump out of bed and do it all again. It was difficult to keep track of the days because I worked so often and always on the weekends. Keeping a plant alive was a ruse in attempt to slow down and breathe. I had to trick myself by adding, ‘Water the Plants’ to my list of chores. I had a cactus, a succulent, an elephant tree, a spider plant, and others with names I didn’t know. I had gathered them $3 at a time from the corner store. I would buy plants as a treat to myself, thinking of it as self-care, and in an attempt to make my space peaceful. I would buy a small bag of soil and carry it home. I would put newspapers on the dining room table and there, I would pot my plants. These quiet mid- afternoons, when the sun came in yellow through our west-facing windows, were happy, fleeting moments that gave me hope. They kept dying. I couldn’t remember when I had watered the plants and I was constantly rearranging them for more or less light. I was anxious and fairly sure I was manic (though undiagnosed). I tracked my moods, and tried to find a pattern. In order to pace myself, I made a chore schedule. This was to steer me away from attempting to do it all. Tuesday was laundry day. I would do 3 loads every Tuesday, lugging the laundry bags from the third floor to the basement, with a pocket full of quarters I had methodically put aside throughout the week. I’d set my alarm and go down and transfer the clothes to the dryer. I’d set my alarm to fetch them and carry them back upstairs. I liked folding the laundry; It was peaceful and the warm clothes were comforting. Seated on the bed while I folded the pile of clothes, I would imagine my future. I probably spent more time cleaning than eating, bathing or reading, but becoming aware of this helped me move forward. I gave the plants a schedule too, and watered them on Wednesdays and Sundays. The schedule helped me tone done the standard I had set for myself. I felt like I was in control, but I was still unhealthy and the plants still wilted. I had yet to learn that it wasn’t control that I needed, but rather, sunlight, fresh air and the nourishment of a small town community. Growing plants in my downtown apartment was as close as I could get to peacefulness. Standing over the sparse greenery, idle with my phone in hand, I closed the relationship advice page, and opened a guide to plant care. I started asking people: How often do you feed your plants fertilizer? How often do you have do laundry? How often do you fight with your partner? In September, I left Toronto, I moved to the country and soon thereafter became single. It was a move I anticipated, but couldn’t conceive until I was here. My frantic city routine was abolished and I found myself busier than ever - but in the most rewarding way. It is a different kind of ‘busy’ in the country. When I first arrived, my step-dad was spending a lot of time in the garden. We were nearing the end of tomato season. Everyday, the tomatoes demanded our attention. Crouching between the aisles of vines, I became closer to nature, and gently plucked tomatoes from the vine. I removed horn worms with a twig and tossed them into a bucket. Lugging the basket of tomatoes inside, my step dad and I would smoke them and make them ketchup or simmer them into a passata. We spoke to farmers and learned we could freeze them whole. The tomatoes were on my mind, and helped me move on from all I had left in the city. These tomatoes gave me time outside, they reinforced my familial bond, they reignited my joy in the kitchen and they opened the gates of communication with famers. I am just as busy as I was in Toronto, but with a much more varied life. People out here take care of one another. After a few months of working at my mom’s cafe, I still struggled with my new identity and finding my place. I learned that if I was willing to work, there was always a job to be done. After a month of adjustment, I started talking openly about how I felt. By being honest about not knowing how I was going to earn a living in Warkworth, I was offered work. I soon found myself with a number of odd jobs. I painted three sheds on a farm, I baked some cakes, I cat-sat, I painted a ceiling for the first time, I packaged gourmet chocolate, and I learned how to check on bees before winter arrived. Out of my element, I didn’t have any control or routine. Everything was so new and country life was sweeping me off my feet. When it got colder and darker, and winter was fierce, I didn’t feel isolated out here, I felt surrounded and supported by my new community. I volunteered at the Arts & Heritage Centre, and soon was hired as the Arts Administrator. I work there now, and absolutely love it. I am still doing a million other things as well. I have found my place here in this magical town. Every person here has a multitude of varied skills and we all learn so much from each other. Warkworth is a very special place. Out here, we are surrounded by both artists and farmers. Many are both. One artist/farmer, and also a friend of mine, recently gave me some of her plant clippings. They survived transplantation and are happy in their new home, on my window ledge. I am growing a number of plants from seed and they have been a pleasure to watch sprout and charge upwards. Just like a little sprout in shallow soil, I teetered upwards before growing any roots - a blind faith everything would be ok. I was propelled forward into the next chapter of my life when I first arrived. The town nourished me. I have survived my transplantation and I am rooted here now. My anxiety has dissolved and what I experienced as mania, I now realize was situational. My first true leaves have emerged and I am excited to see how my life grows. My house is full of lush greenery, happy cacti and blooming flowers. I have created a precious place I can call home. morning yoga routine. I say good morning to the plants. I feed my cat and then myself. 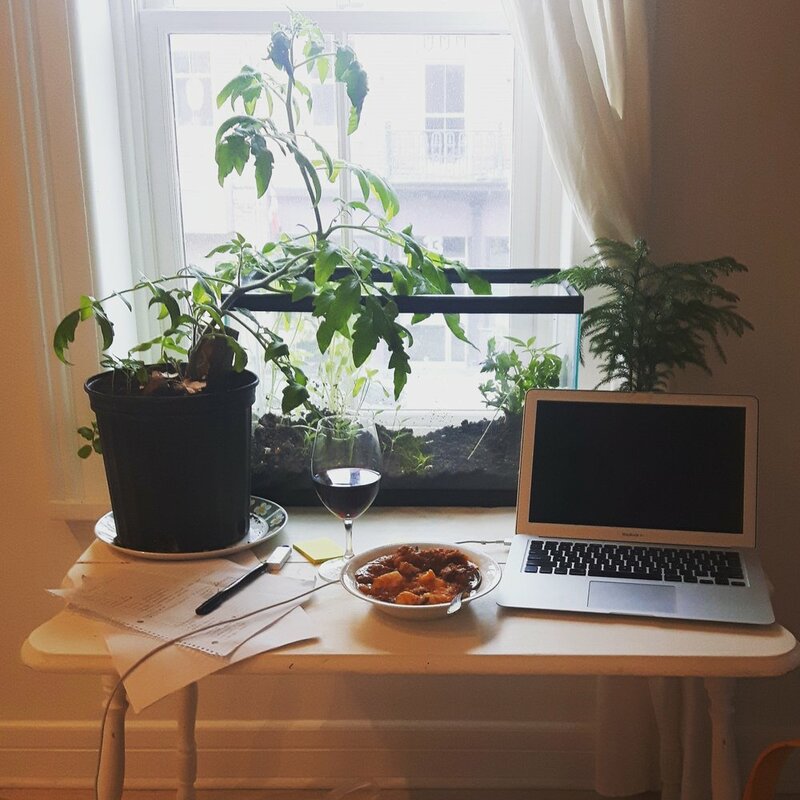 While I eat, I quietly reflect and enjoy being surrounded by plants and silence. If the plants look thirsty, I water them. They are thriving, and so am I.